Young loving couple lying in tent under trees and having rest after hiking in mountains. Three young friends cycling in park. 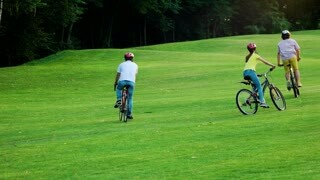 Young bikers riding bicycles on green grass. Summer sport and rest. Young woman is stroking lovely puppy and talking to it expressing love while they are lying on bed in modern flat together resting. Loving animals and youth concept.